Exiled during the war, Itsik eventually finds himself in New York, working as a typesetter and writing poetry to his muse, the butcher's daughter, whom he is sure he will never see again. But it is here in New York that Itsik is unexpectedly reunited with his greatest love - and, later, his greatest enemy - with results both serendipitous and tragic. His story is recounted in his memoirs thanks to the most unlikely of translators - a twenty-one-year-old Boston Catholic college student who, in meeting Itsik, has embarked upon a great lie that will define his future and the most extraordinary friendship he'll ever know. 1. "Now that I have read them all, I know the many ways in which the tale of Malpesh's life resonates with the events that led me to his door: a failed love affair, lies of faith, threat of scandal, and, most important, the promise of deliverance through the translation of words. (p. 7)" To what extent does the translator's involvement with Malpesh seem grounded in his own preoccupations and emotional needs, rather than in an exact rendering of those of his subject? When he writes of "deliverance through...translation," what kind of redemption is he looking for, and how does he achieve it in Songs for the Butcher's Daughter? 2. How would you characterize Sasha Bimko's role in the birth of Itsik Malpesh? How does Malpesh's account of his birth compare to the reality that Sasha discloses to him as an adult? What does his own romanticized vision of his entry into the world reveal about Malpesh's personality? Why does the translator decide to include both accounts of Malpesh's birth in his translated memoir, despite their contradictions? 3. "In such an environment, not passing would have required a concerted effort. And, worse, it might have been disruptive. Why bother insisting I was not a Jew when such insistence would only confound everyone around me? (p. 41)" How does the translator's decision to conceal his true religious identity as a Catholic affect his interactions with his coworker, Clara, and with Itsik Malpesh, the subject of his translation? What does his decision to feign being Jewish reveal about his own comfort with his actual identity? 4. "[M]y secret learning came at a cost. How could I forget the daily labor I endured to remain housed within this new castle of the mind? (p. 63)" How does Itsik's deception of his family in order to learn how to read Russian compare to his translator's deception of his employers to learn Yiddish? How does each man's discovery of a new language open up new worlds to him, and what do these worlds represent in terms of future possibilities, hopes, and dreams? 5. How is Chaim Glatt responsible for changing the course of Itsik Malpesh's life as a young boy in Kishinev, and how does that compare to his impact on Itsik, the young and naive émigré in New York, in his newly adopted persona of Charlie Smooth? What accounts for their seemingly irreparable connection to each other? To what extent is Itsik's implication of Chaim in the death of Hershl Shveig a kind of payback for Chaim's mistreatment of him over the years? 6. "Owing to my own relative ignorance when I first encountered his work, I did not mention any of the larger issues of accuracy...merely some incidents that, to my mind, strained a reader's confidence in his reliability. (p. 85)" How does the series of translator's notes that appears in the narrative of the Songs for the Butcher's Daughter affect your reading of the life story of Itsik Malpesh? How did the translator's role in the narrative inform your appreciation of Malpesh? To what extent can you imagine this novel stripped of the translator and his story? 7. "Is my bashert then Sasha Bimko? (p. 52)" I asked. How does his idealized vision of Sasha Bimko as his destiny, his beloved, and his muse enable Itsik Malpesh to focus his budding ambitions as a poet? In what respects does Malpesh's attachment to Bimko seem to be grounded in a kind of self-preservation, as she is his one living connection to his birthplace and his family? To what extent does their eventual romantic involvement seem inevitable, and why does the resolution of that relationship in Songs for the Butcher's Daughter, draw in Malpesh's translator and his girlfriend, Clara? 8. How do the unfortunate circumstances surrounding Malpesh and Hershl Shveig's first encounter compare to their later involvement as adults? Why does Malpesh misinterpret Shveig's interactions with Sasha? What role do their religious differences of opinion play in Malpesh's inability to comprehend Shveig's innocence? How would you characterize the consequences of Malpesh's actions against Shveig? Why does the translator choose to relate this information in his translation of the memoir, rather than expose Malpesh to the authorities as a murderer? 9. "There is more to tell about how I came to be the translator of Itsik Malpesh, and about the great joke of the fates this arrangement would come to seem.(p. 6)" How do the translator and Malpesh seem fated for each other? How does the translator's connection to Sasha Bimko, through his relationship with Clara, lead Malpesh back to his bashert? How does "the great joke of the fates" (p. 6) seem to be at play throughout Songs for the Butcher's Daughter, given the many quirks of coincidence that bring characters back into one another's lives? 10. 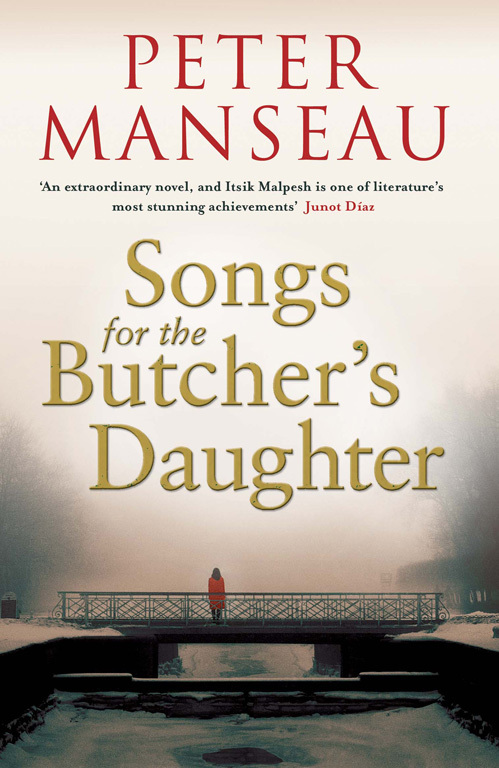 Of the many characters who populate Songs for the Butcher's Daughter, which did you find most compelling, and why? Given the novel's simultaneous narratives -- the story of Itsik Malpesh, and the story of his translator -- did you feel that either story was more engrossing, or did both engage you equally as a reader? To what extent are these dual narratives able to be separated from each other, and what argument might the author be making about the nature of translation in their interconnectedness? 1. In Songs for the Butcher's Daughter, families become separated by war, ethnic and religious violence, and longstanding disagreements. Many of them carry around fragments of their lost families in the form of letters, photographs, stories, and memories. How do you carry around your family with you? What historical documents, letters, images, and stories do you feel depict your relationship with the far-flung members of your family? If someone were translating your life into a book, what would be the essential pieces that would help him or her make sense of it? You may want to bring some of these pieces to your next book group gathering, to share the sense of belonging and separation that comes with being part of a family comprised of many generations. 2. Oy vey! Peter Manseau's book makes use of deep wordplay to explore the remarkable flexibility of the Yiddish language. Have you ever wondered how many words you know and use in everyday conversation that derive from Yiddish? Are there Yiddishisms you know that you aren't entirely sure of the meaning of? Visit the Yiddish dictionary online to enter words in either English, Yiddish, or Hebrew to learn more about your own Yiddish references: http://www.yiddishdictionaryonline.com. 3. In Songs for the Butcher's Daughter, entire families are lost to one another in the course of their immigration to America. Today, tremendous digital resources exist to enable families to track their ancestors' arrivals to America. Accessing a database of some 25 million records of immigrant arrivals, the Statue of Liberty-Ellis Island Foundation enables visitors to search (for free) by name or date of birth for long-lost relatives. Do you know when your family first arrived in this country? Visit http://www.ellisisland.org to begin your search for your ancestors. You may want to compare notes with your fellow book club members about your findings. Peter Manseau is the author of Vows and coauthor of Killing the Buddha. 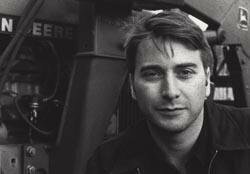 His writing has also appeared in The New York Times Magazine, The Washington Post, and on National Public Radio's All Things Considered. A founding editor of the award-winning webzine KillingTheBuddha.com, he is now the editor of Search, The Magazine of Science, Religion, and Culture. He lives with his wife and two daughters in Washington, D.C., where he studies religion and teaches writing at Georgetown University.